"Based on the proceedings of the first conference on superconvergence held recently at the University of Jyvaskyla, Finland. 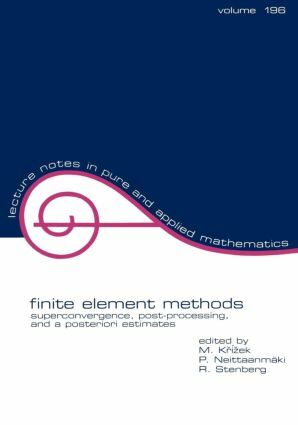 Presents reviewed papers focusing on superconvergence phenomena in the finite element method. Surveys for the first time all known superconvergence techniques, including their proofs." Two robot patch recovery methods with built-in field equations and boundary conditions; superconvergence similarities in standard and mixed finite element methods; on the FEM for the Navier-Stokes equations in the domains with corner singularities; projections in finite element analysis and application; element analysis method and superconvergence; quadratic interpolation polynomials in vertices of strongly regular triangulations; explicit error bounds for a nonconforming finite element method; analysis of the average efficiency of an error estimator; on the mesh for difference schemes of higher accuracy for the heat-conduction equation; shape design sensitivity formulae approximated by means of a recovered gradient method; a posteriori error estimates for three-dimensional axisymmetric elliptic problems; hierarchical basis error estimators for Raviart-Thomas discretizations of arbitrary order; the superconvergence of finite element methods on domains with reentrant corners; error estimation for linear and nonlinear problems; superconvergent recovery operators - derivative recovery techniques; superclose FE-theory becomes a table of integrals; adaptive finite element method for systems of reaction-diffusion equations; pointwise error estimates, superconvergence and extrapolation; approximate solution of problem on viscous flow with evaporating non-compact free boundary; shape calculus and FEM in smooth domains; general principles of superconvergence in Galerkin finite element methods; a survey of superconvergence techniques in finite element methods; adaptive procedure with superconvergent patch recovery for linear parabolic problems; bibliography on superconvergence.